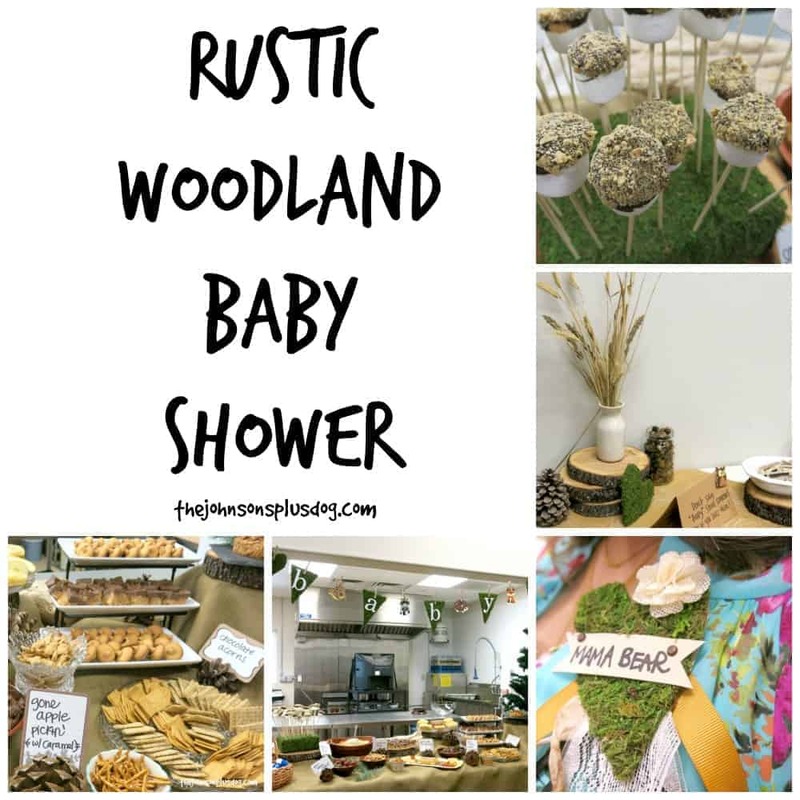 If you’re planning a rustic forest baby shower, you’ve got to see this DIY craft idea. 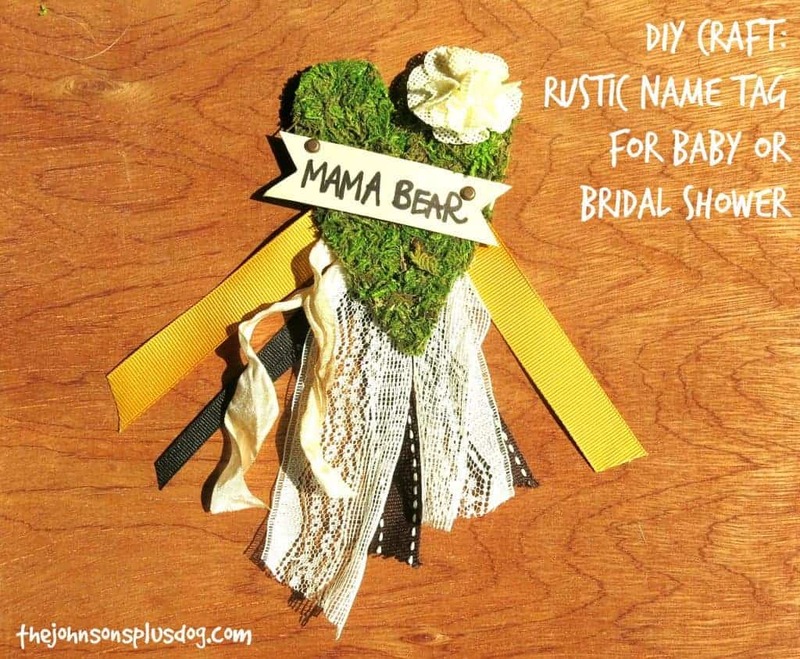 See how to easily make this rustic baby shower name tag for your guest of honor – mama bear. She’ll feel so special on her big day. 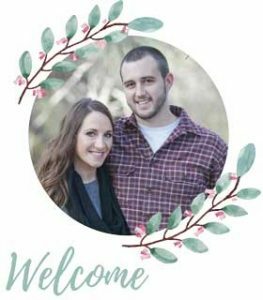 This baby shower name tag post contains affiliate links, but nothing that I wouldn’t wholeheartedly recommend anyway! Read my full disclosure here. First up we have this fun baby shower name tag. We used moss a lot in the decor of the shower to tie in the rustic forest theme, so I had purchased a big roll of Super Moss Instant Green. 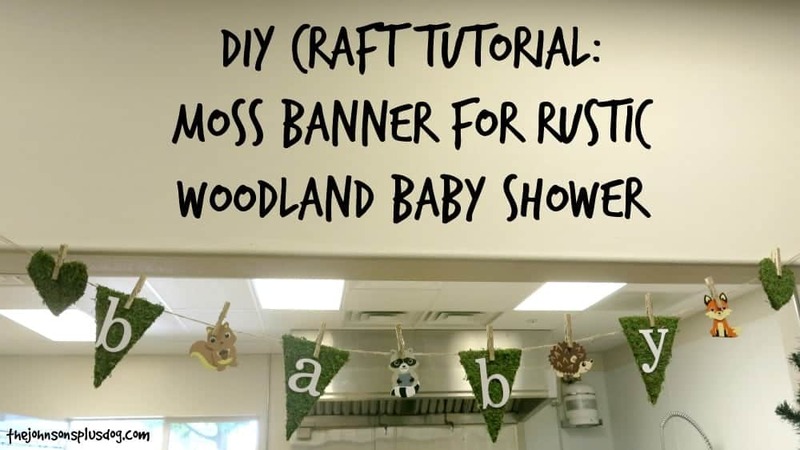 (We also made this fun moss covered banner for the shower, check out the tutorial here). 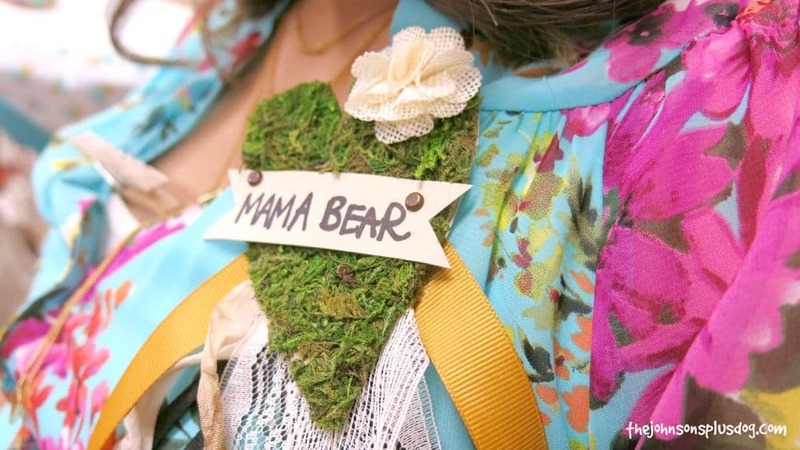 I knew I wanted to make her a cute name tag to wear at the shower as the guest of honor and I thought “Mama Bear” was perfect for the theme. But that’s where my ideas stopped. I went round and round trying to find inspiration. 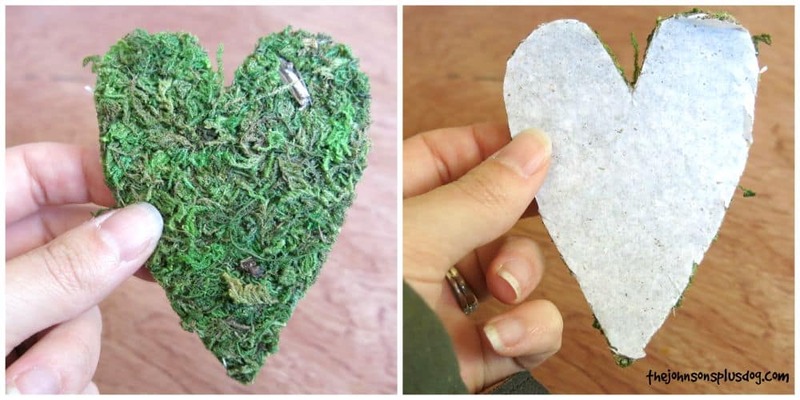 I was thinking maybe a circle cut out, then I was thinking a chalkboard look, then I was thinking about a pinwheel… ultimately the moss heart idea dawned on me as I was cutting out a bunch of moss for something other projects and started making some moss hearts to put around party. 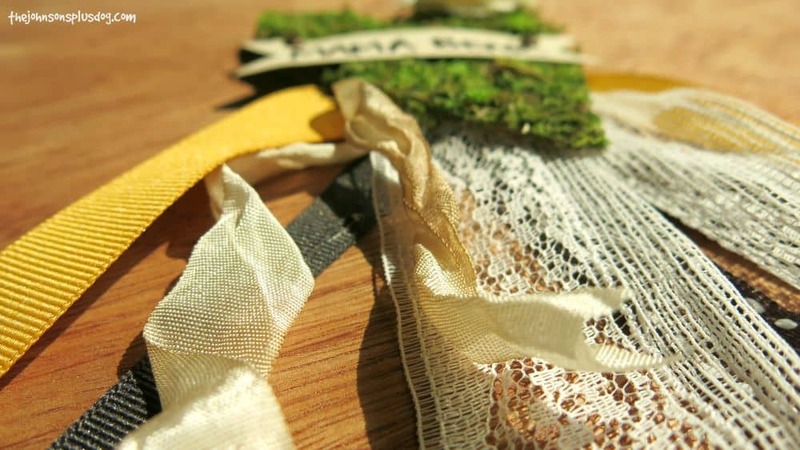 I instantly fell in love with this moss heart idea with ribbon hanging down for the baby shower name tag. 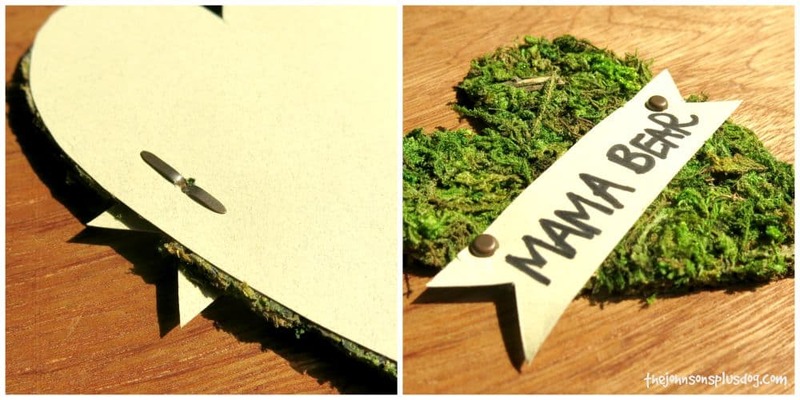 It was pretty simple to make, so let’s get right to it and make this baby shower name tag! 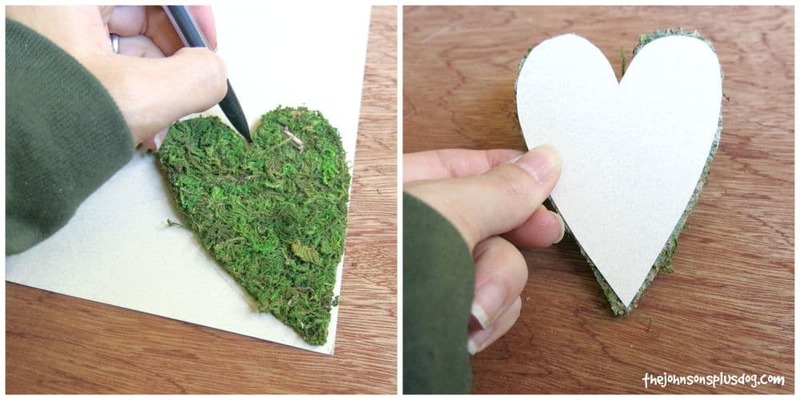 I just drew the right size heart on the paper moss backing and cut it out. 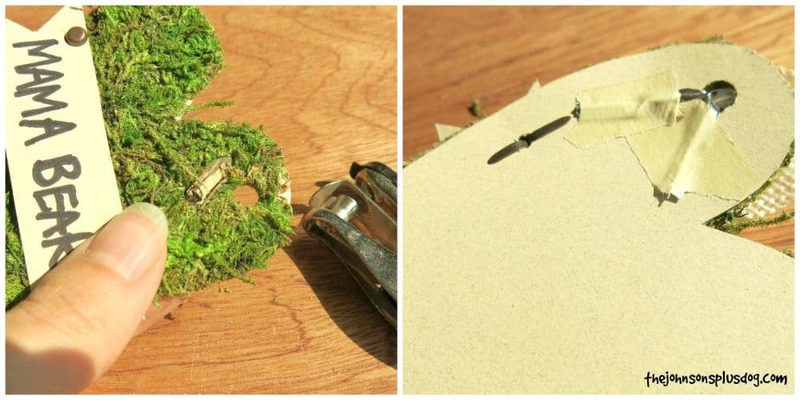 Warning: this moss can get messy so cover your work area first. Holding the heart on to the the cardstock paper, I traced the heart. Cut out with scissors. I removed the paper backing on the moss before I glued on the paper, but you totally don’t have to. 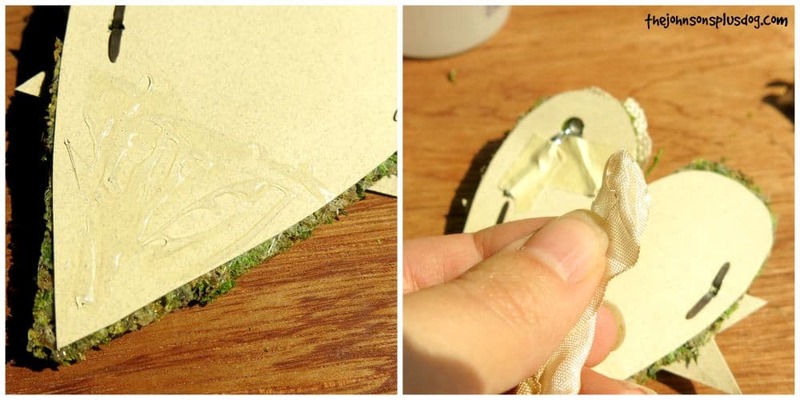 Using the 3-in-1 glue, apply glue to paper heart and press on to the back side of the moss.You may need to hold it for 30 seconds or so for the glue to fully adhere. I knew roughly the size of paper banner I wanted and just used my paper cutter to cut a strip of paper and then make the “v’s” on each end with my scissors. I then used a sharpie to write out “mama bear”. You can write whatever you want on your banner. How fun would this be for a “Bride-to-be” name tag for a bridal shower? I could have just glued the banner on the moss with the 3-in-1 glue and it would have probably worked just fine, but I was a little cautious because I was thinking that the moss is kind of fragile and may rip off easier if the banner was glued. I figured she would be hugging people a lot at the shower so I wanted make the baby shower name tag very sturdy. To achieve this, I used mini long brads and clipped it on. I just punched small holes in the paper and then lined them on to where I wanted it to lay on the heart and punched those holes and fed the brads through. This part is totally optional, but I like the extra little “flair” it adds to the baby shower name tag. 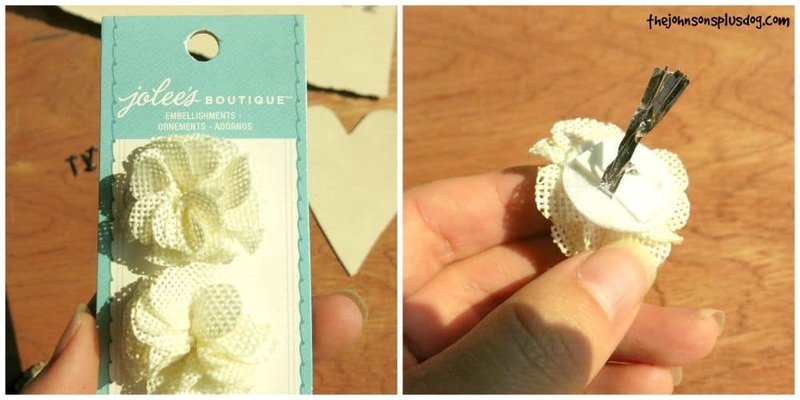 The flower comes with little twisty ties which are primarily to attach it to the packaging and it has a sticker part that is usually used. But I didn’t think that it wouldn’t stick well to the moss, so I kept the twisty ties and punched a hole and threaded them through like I did with the brads. I added tape on the back to secure (the only tape you can find in my house right now is masking or washi, haha). Usually I always staple ribbons on to my projects. 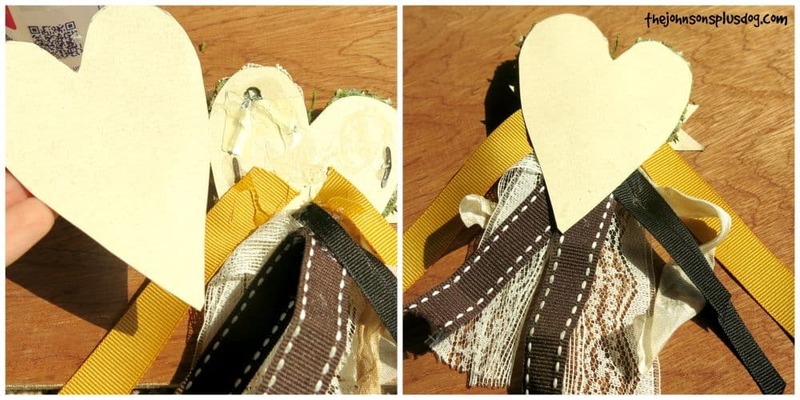 I find that it’s a quick and easy way to get the ribbon to stay just right. However, I have no idea where my staple refills are for my stapler right now and I kept forgetting them at the store when I was working on this. So I used gobs on 3-in-1 glue and it worked fine. Still, if I was to make this again I’d staple the ribbon to a cut out paper heart and put another (a third) cut out paper heart on top to hide the staples so the badge doesn’t get snagged on anything. Since I used the glue, I added a layer of glue on the bottom half of the heart and started laying on the ribbon how I wanted it. after I was finished adding ribbon I added more blue on top of the ribbon and on the top half of the heart and laid on paper heart. Again, you may need to hold it tight for about 30 seconds (maybe more on the thick part) while the tape adheres. I actually clipped on a clothespin over the thick area with the ribbon and came back a few hours later, but don’t know if that was necessary or not – it just worked better for my schedule 🙂 ! 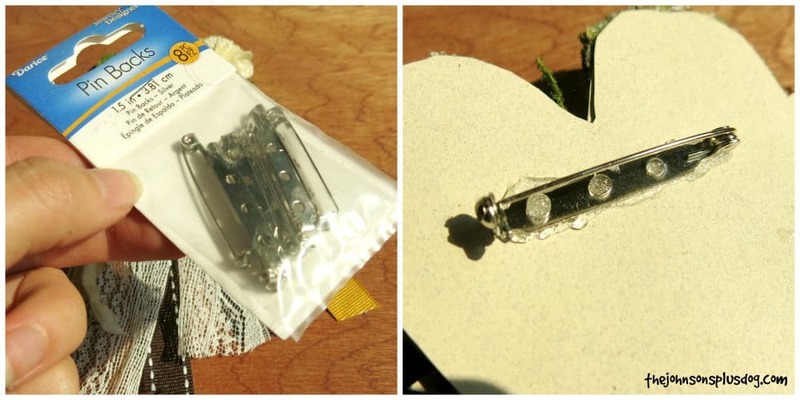 I used more of the handy 3-in-1 glue to attach the pin back clasp. I added it to the pin back and held it in place for about 15-30 seconds. Step Nine // Admire your work! Step back and admire your work. Your guest of honor will feel so special with this name tag for their shower. Oh that’s adorable. I love the theme of the shower and the play on words for the tag. Once again – it’s great co-hosting the #HomeMattersParty with you! So cute, and such a great tutorial. Also, great to be co-hosting #HomeMattersParty with you this month! LOVE it! 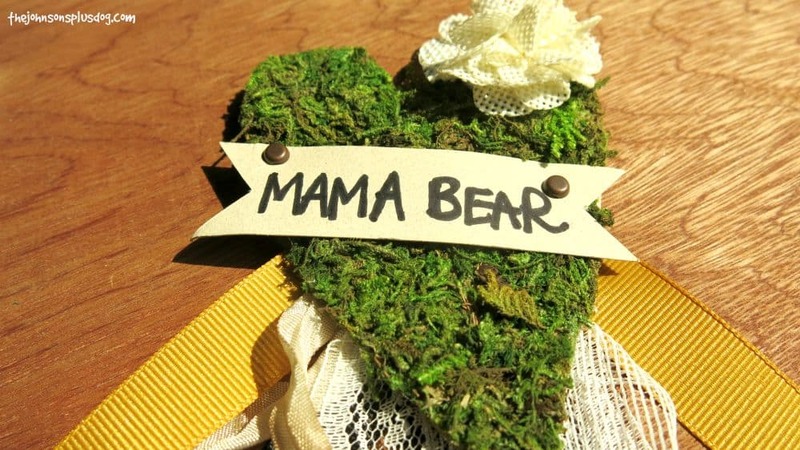 Mama Bear…it’s perfect. 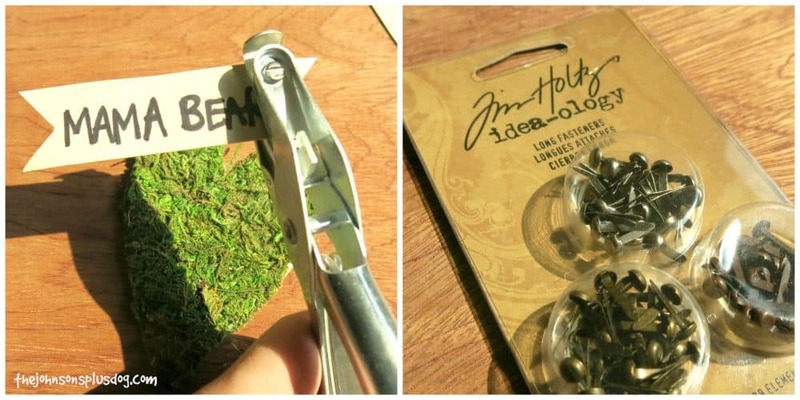 The name tag is adorable and such a great use of supplies we have readily available to us. Great to be cohosting with you at #HomeMattersParty.